It was a sweet moment for Lawton Elementary School fourth-graders in Teri Fraley’s class: Collecting 110 pounds of candy from Halloween trick-or-treaters and benefiting the troops overseas proved to be a double treat. Fourth-graders in Teri Fraley's class at Lawton spearheaded a candy drive, collectin 110 pounds that will be sent to military troops serving overseas. 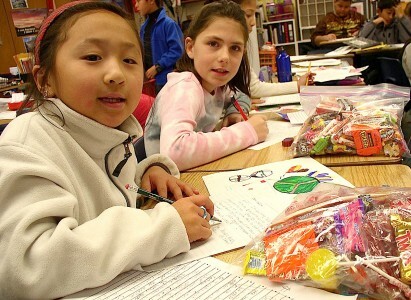 Here, students write letter and draw pictures to be sent with the candy. Earlier this month, students packaged candy into one-pound bags, wrote letters and drew pictures for military personnel serving overseas. Fraley said she got the idea from watching a segment on Good Morning America, where dentists from around the country were paying children to bring in their candy and then were shipping the candy overseas. Fraley reached out to the rest of Lawton, asking other students to bring in their candy, where she bought it for $1 per pound. Fourth-graders visited other classrooms to explain their candy drive and, ultimately, filled a long table with bags of treats. The class researched groups and website that donate to the troops, but Fraley ultimately contacted her nephew to make the necessary contacts overseas. One student asked in his letter: “I want to ask you some questions. How are you? How are you feeling? Thank you for what you are doing,” he wrote. In addition to finding a unique way to share unused candy, Fraley has been involved in the school’s “greening” in other ways, finding ways to reduce, reuse and recycle. Her classes have collected and recycled used plastic and snack bags during school lunch hours in an all-school effort to reduce items going to landfills. The most recent project Fraley is proposing is for the school to use Wrap “N Mats, a reusable product that will allow students to bring their sandwiches and other items to school without using disposable bags. She contacted the company and received a discounted price if they place an all-school order.